Register for a hoopla account by visiting hoopladigital.com and click the button Get Started Today. First, choose the email address you would like associated with your hoopla account, and choose a password. On the next screen, you'll choose your library. 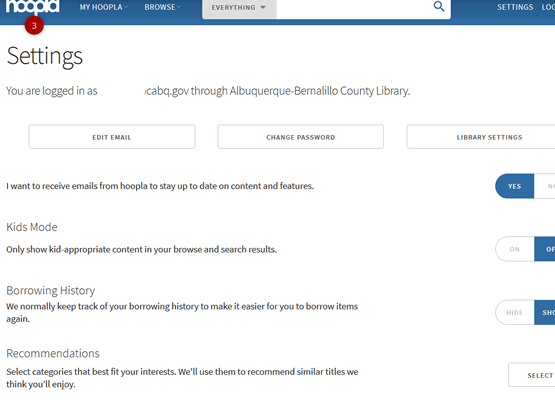 Since your location can be determined by your connection location, Albuquerque-Bernalillo County Library may be the first result below the search box; if it is not, go ahead and search. Click Next and then enter your library card # and PIN. You're all set! Under the hoopla icon on the upper-left corner are the number of remaining checkouts. 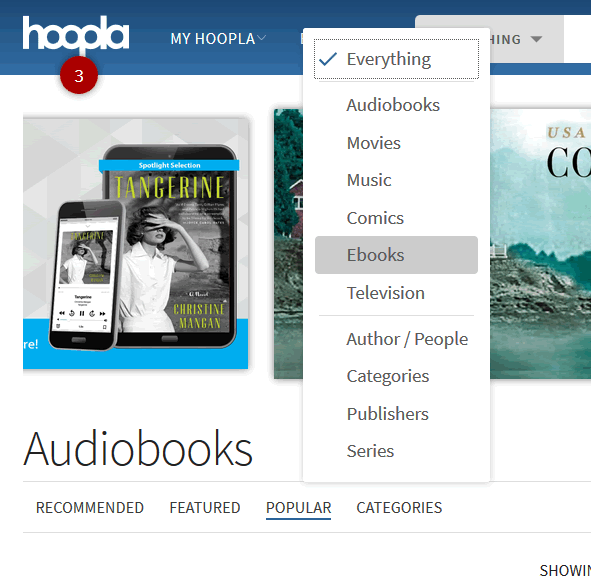 View your current checkouts and more under the My hoopla link, and look for videos, music, audiobooks, and comics under the Browse link. 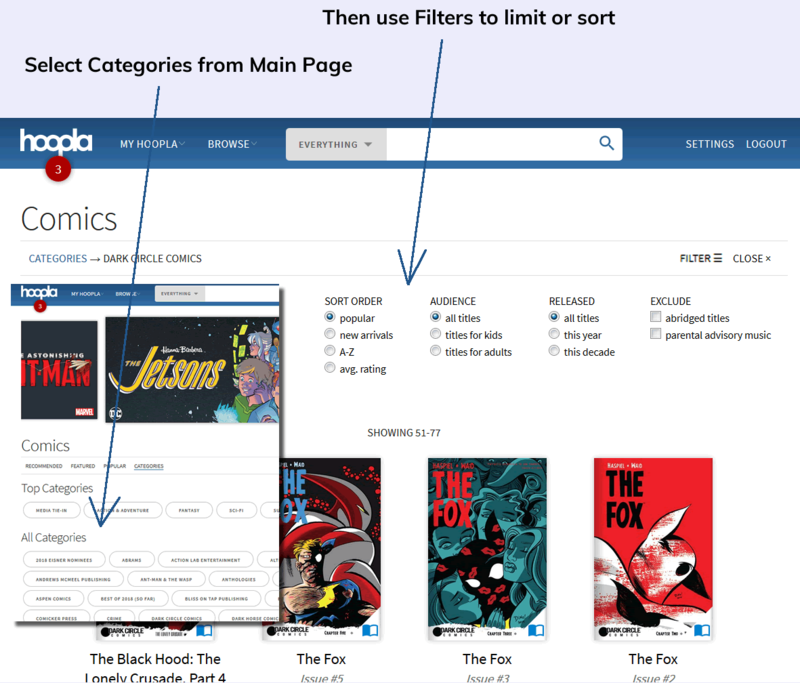 Search for a specific title by clicking on the Search box; limit to a certain format using the dropdown arrow, and also limit to creators/people or subject categories. 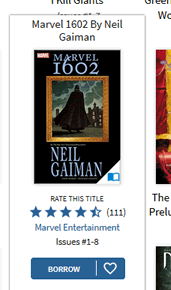 To borrow, use the blue Borrow button either directly from the browse/results screen or click on the title for more details, rating, information on subtitles, and clickable subjects. 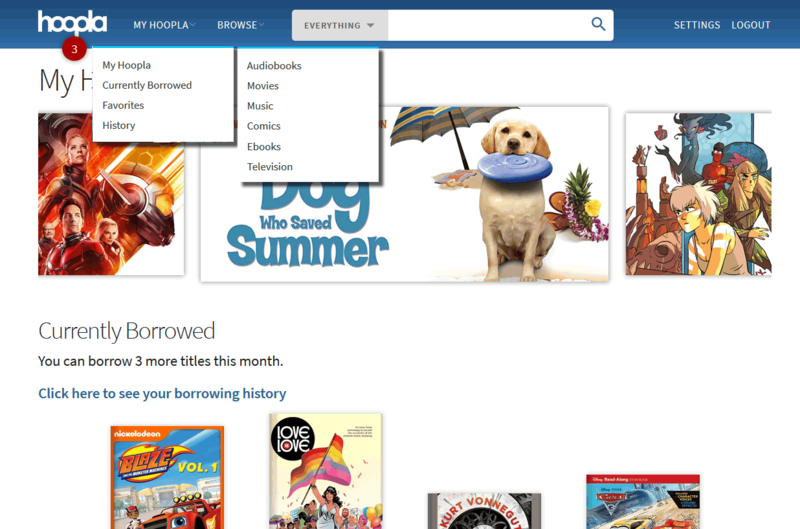 Return to My hoopla to see current borrowed items, and hoopla will always keep your place, no bookmarking required. Also, since the desktop site and app are well integrated, borrowed titles and bookmarks are the same on the desktop site or the app. Borrowed titles are automatically returned when the lending period is over. hoopla content is always available on-demand, there are no holds, waitlists, or late fees! View or listen to borrowed content as often as you would like during the checkout period. Return any borrowed title if you're done before the end of the checkout period. To download titles and use them when you're away from the desktop, grab the hoopla app for Android, iOS, or Kindle so that you can enjoy on the go! To edit email address, update your library card, PIN, or change your password, use Settings in the upper-right hand corner of the page. Also, this is where users can turn on Kid's Mode and edit what recommended titles they would like to see when visiting the site. If you change the PIN on your Library Card you need to come here, go to Library Settings, and then update the saved PIN with your new PIN which is saved with your Library Card number here.